In Detroit’s southwest corner near the Detroit River in the Delray neighborhood, the owners and patrons of Kovacs Bar are counting down the days until the old tavern is demolished. In its place, the marker of Detroit’s new modern age – the Gordie Howe International Bridge. Providing a new trade and tourist crossing between Michigan and Canada, city officials have celebrated the community benefits of the new project citing 48 million dollars in funds for job training, health monitoring, and other neighborhood improvements . But the price of change is too often history. Official bridge project report for the State of Michigan and the public. The U.S. Point of Entry is shown in the middle of Delray, which is divided by West and East. Notice the proximity to highway I-75 colored black. Current Kovacs owner Dolores Evans summed up her thoughts on the demolition and modern day Delray, “It’s kind of sad to see the historical building gone… It’s changing times, and you know, the bridge is needed and it’s just the way things happen” . Delray’s history, like Detroit, has endured diverse peoples, population change, the rise and fall of manufacturing, and a Rust Belt reputation. Most of all, Delray and Detroit are undergoing forces of urban renewal that will destroy old buildings in favor of the new and improved. Front entrance of Kovacs Bar at the corner of West Jefferson Ave. and Post St. The historical building will be destroyed to make way for the new international bridge. Source: Google Maps. Urban renewal in Delray challenges not just the people and places of the present, but those of the past who used to call the neighborhood home. Kovacs Bar dates back 128 years to a time when the bar was given its name by an immigrant owner and was visited daily by an immigrant population that dominated Delray . Hungarians were the first immigrant group to occupy Delray as a majority and turn it into a cultural center during the late 1800s and early 1900s. The destruction of Kovacs Bar will put further distance between ourselves and the Hungarians of Delray’s past. More so, the small amount of information on them in news stories, books, and articles makes their history even harder to reach. The following is an attempt to reclaim some of that Hungarian past in Delray. With the Great War at an end, John Albert Yaczik made his way home in 1919 to 1545 Springwells Ave. in the northwest corner of Detroit’s Delray neighborhood. As a tool maker he spends his days as part of the massive automotive and manufacturing workforce in the town soon to be nicknamed the “Motor City” . 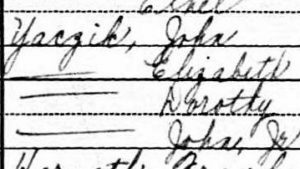 A 1930 federal census record showing the names of the Yaczik family starting with John followed by Elizabeth, Dorothy, and John Jr.
Elizabeth immigrated first as a baby in 1900 and John nine year later in 1909 at the age of 10 . John and Elizabeth were part of the great second international migration at the turn of the twentieth century that saw hundreds of thousands of Eastern Europeans find their way to the States. The two built a life with each other, ultimately, having two children – Dorothy in 1921 and John Jr. in 1923. John and Elizabeth were raised in Delray and they started their family here, for in some ways, in a lot of ways, the neighborhood felt like home. They were living in a neighborhood with a strong Hungarian identity. A 1930 federal census record showing in columns from L to R: place of birth, father place of birth, mother place of birth, and native language. The first row is John then Elizabeth, Dorothy, and John Jr. following. Notice John and Elizabeth’s native “Magyar” language. John and Elizabeth are my great grandparents on my mother’s side, making Dorothy and John Jr. my great aunt and grandfather. 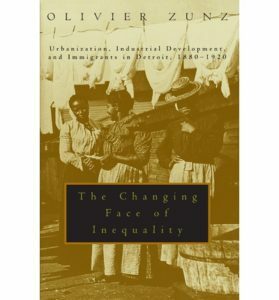 Though I know little of my great grandparent’s history, Oliver Zunz’s historical research on turn of the twentieth century Detroit in his book The Changing Face of Inequality: Urbanization, Industrialization, and Immigrants in Detroit, 1880-1920 can help give life to their story and to the history of Hungarian Delray. His book has the advantage of being one of the most complete studies of Hungarians in Detroit. Also, his use of numbered data leads to an even better understanding of the immigrant population. Furthermore, Zunz’s goal of showing how the “first industrial Detroit came to exist” places Hungarians along with other immigrant groups as main characters in Detroit’s early manufacturing past . This history will certainly be incomplete. There are far too many people with Hungarian roots in this neighborhood that need to share their stories. 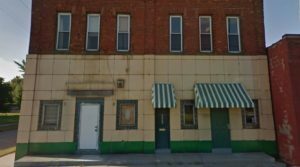 With the destruction of Hungarian historical landmarks like Kovacs Bar due to urban renewal, the need to try and piece together this immigrant history is a must or it might be lost entirely. Delray got its start in 1836 when it was first named Belgrade . After town leader Augustus D. Burdeno returned from the Mexican-American War in 1848 he persuaded the townspeople to rename the town Delray after the Spanish saying that meant “of the kings” . Delray became a village of Detroit in 1897 and in 1907 it was officially incorporated into the city . Delray continued into the 1880s without a concrete immigrant identity. Hungarians at this time represented only a tiny minority of Detroit’s foreign makeup with only .14% of all immigrants in the 1880s and 1890s . Solvay Process Company along the River Rouge near Delray in 1898. One of the many industries that first attracted Hungarian immigrants before the rise of auto jobs. Source: Burton Historical Collections at the Detroit Public Library. However, the rise of manufacturing industries right before 1900 enticed Hungarian immigrants to move to Detroit . These initial industries were not all auto related. Many were chemical industries such as the Sulphite Pulp and Paper Company along the River Rouge near Delray and the Solvay Process Company that made glass products among other things . In addition, Detroit was one of the leading manufacturers of stoves in the country with such businesses as Detroit Stove Works . The increasing number of jobs in U.S. cities like Detroit, along with the chance to escape the political turmoil of Europe, most likely made for a better future for many Hungarian immigrants, even if that future was still uncertain . The industries of the late nineteenth century gave way in the early twentieth century to the rise of automotive jobs. With the building of auto assembly plants by Dodge, Packard, Cadillac, and Henry Ford’s River Rouge complex there was a major increase in the Detroit Hungarian population . 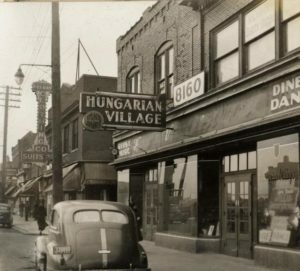 In 1910 Hungarians jumped to almost four percent of Detroit’s foreign population and by 1920 they were almost five percent while being the sixth largest immigrant group in the Detroit industrial workforce . 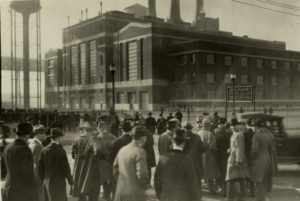 Workers stand outside the Ford Rouge Plant that employed thousands of Hungarian workers in the early 1900s. Source: Burton Historical Collections at the Detroit Public Library. In 1920, Hungarians surpassed other immigrant groups that used to outnumber them at one point in the past, such as French Canadians, Irish, Norwegian, Swedish, Danish, Belgian, Dutch, and French immigrant groups . The location of manufacturing and auto industries in and around Delray, such as the Ford River Rouge site, drew Hungarians such as John and Elizabeth’s families to this location during the early 1900s. Zunz talks about the creation of Delray as a Hungarian neighborhood, “The creation of Hungarian Delray is a classic example of a mill town within a metropolis… an ethnic community of factory workers, clustering away from other working-class groups of different ethnic origins” . Like other immigrant groups, Hungarians settled in a neighborhood with only other Hungarians that was near their place of employment. The influence of Hungarians in Delray was so great that by 1920 72% of all Hungarian immigrants lived in this neighborhood . With the majority of these Delray Hungarians as factory laborers, Delray was also a working-class neighborhood and would remain so until after 1920. Detroit made cars parked outside of Hungarian businesses in Delray during the early 1900s. Source: Burton Historical Collections at the Detroit Public Library. The city noticed the increase of foreign peoples into the work force during the early twentieth century and created an Americanization committee to help immigrants learn English and citizenship skills . On the board of the committee were Hungarians Anton Feder, head of the Magyar Hirlap, and newspaperman George Kemeny . The committee printed advertisement handbills in multiple languages including Hungarian . The committee tried to get workers to night school, but were more successful visiting factories and partnering with industries, which allowed for committee networks to be set up inside Delray . The Solvay Process Company for instance helped the committee organize informational meetings within the neighborhood . Women were also a part of these Americanization efforts as night school was set up for immigrant women to learn how to care for children and their homes . The committee could have helped John obtain naturalization status since his 1930 federal census record shows him already being naturalized. Though it did address immigrant women, the committee’s emphasis on male factory workers could have effected Elizabeth’s status as a legal alien on the same census report. 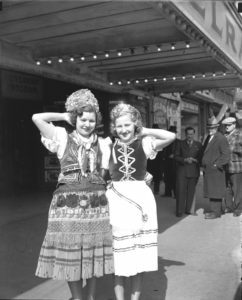 The Delray entertainment district in the early 1900s where two Hungarian women wearing cultural dresses are posing for a photo underneath a theater awning.Source: Burton Historical Collections at the Detroit Public Library. Throughout the early 1900s Hungarians inhabited Delray in high numbers and developed a strong sense of culture and community. Many Hungarians grew to have nuclear families in Delray just like John and Elizabeth. Zunz describes Hungarians as having “a very large proportion of homeowners” and a “flourishing family life” . Despite the large amount of industrial workers among Hungarians, family and community remained priorities. Another key part of this community was religion as many Hungarians practiced Catholicism at such Delray area churches as the Holy Cross Hungarian Roman Catholic Church, which opened in 1906 . With a thriving community came businesses, arts, and entertainment with theaters that catered to the Hungarian language. John and Elizabeth (my great grandparents) in Delray circa 1950. Zunz’s work ends in 1920 when European immigrant groups gave way to the Great Migration in which millions of African-Americans traveled North to escape Jim Crow segregation in the South . Hungarians still lived in Delray during this massive population change, though in decreasing numbers. Migration to Detroit slowed and then stopped after 1920 due to anti-immigration laws . Hungarian factory workers who moved up in management could afford to escape chaotic city life and live elsewhere . Others wanted to fulfill the post World War Two American Dream and live in the suburbs of the city as my grandfather did when he moved his family to Bloomfield Hills in 1962. 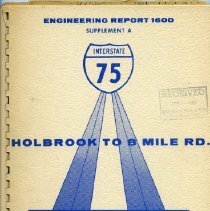 Cover of I-75 project report. Just like the International Bridge of today, urban renewal in the mid-1960s challenged Delray and Detroit once again. 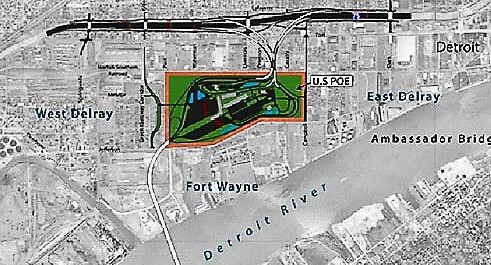 The construction of highway I-75 (see map image above) divided Detroit in half and destroyed homes in Delray forcing more Hungarians out of the neighborhood . I-75 most directly hurt Detroit’s African-American community in the Black Bottom neighborhood near downtown. The highway’s construction is seen as a factor in the Detroit racial uprising of 1967 and the poor relationship between black and white in the region today . Waiting for its coming demolition, the First Latin American Baptist Church still stands on Fort St. in Delray. Source: First Latin Church. All of these reasons contributed to Delray becoming less Hungarian over time allowing for new immigrant groups to make the neighborhood their home such as the Mexican-Americans of today. And like Kovacs Bar and the Hungarian Delray past, the Mexican-Americans of Delray are facing a similar threat. The First Latin American Baptist Church, which has served a mainly Mexican-American congregation since the seventies will be destroyed to make way for the International Bridge . With First Latin’s destruction and the relocation of the Mexican-American congregation alongside the removal of Kovacs Bar, Detroit’s larger immigrant past is at risk of being lost and forgotten. 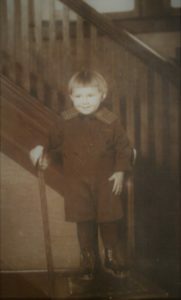 John Yaczik Jr. (my grandfather) as a child in their Delray home. Hungarian cultural markers still exist however. Churches such as the Holy Cross Hungarian Roman Catholic Church still stands. Restaurants such as Hungarian Rhapsody still serve Hungarians as it did my family and myself during special occasions. And culture clubs bearing the Magyar name still seek out membership in small ways. Amidst the post-1920 changes, the Yaczik family lived on as well. John continued his work in the auto industry and Elizabeth continued her domestic duties. 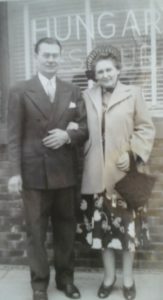 Dorothy and John Jr. grew up learning and speaking the Hungarian language and eventually had lives and families of their own including my mother and uncles. Elizabeth passed away before John in the 1950s with John dying in 1965. These two left behind a family line that extends to myself, but also unfortunately limited ways to trace their footprints. But that’s the power of history, to help fill in those silences and find what is lost and Oliver Zunz’s book has helped in that mission. As urban renewal, such as the Gordie Howe International Bridge in Detroit, continue promising a bright future, the history of the city’s immigrant peoples is at risk of being lost. If the modern-day Mexican-American residents of Delray are already undergoing this displacement, how are the residents of Delray’s Hungarian past going to hold up? This is a question that deserves an answer. This webpage is an attempt to hold on to that Hungarian history for those who have already been forgotten or are currently being forgotten. Though the bridge improves one of the busiest international U.S. border crossings, honors a hockey legend, and will possibly bring much needed dollars to downtrodden parts of the city, history is at stake. Cities need to be rebuilt and things must change, but places have a past. Before the destruction, we should all take note of the humanity that has long existed in a world bent on losing its history. Any errors in this site are my own and comments are encouraged. For additional information regarding Delray’s Hungarian past visit the Further Reading link and keep piecing this history together. Sean M. Wright is a Ph. D. student in the history department at Michigan State University. His larger historical interests include race, class, and gender in the nineteenth and early twentieth century U.S. 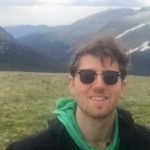 Being from Southeast Michigan, he is most interested in the history of labor and race in Detroit during Reconstruction, the Gilded Age, and the Progressive Era. Detroit Free Press article, ” Detroit church in path of Gordie Howe Bridge will be demolished, leaving only memories.” Published 11:03 p.m. ET Aug. 15, 2017http://www.freep.com/story/news/local/michigan/detroit/2017/08/15/gordie-howe-bridge-first-latin-american-baptist-church-delray/564696001. 1930 federal census record and prior family knowledge. Oliver Zunz, The Changing Face of Inequality. University of Chicago Press. 1982, 403. Sun Sentinel article, “Delray Could Have Been Named Belgrade Beach.” Published June 17. 1994 by Fred Lowery.http://articles.sun-sentinel.com/1994-06-17/news/9406160360_1_mexican-village-del-rey-detroit-public-library. Detroit Free Press Kovacs Bar article. Detroit Free Press First Latin Church article. http://www.freep.com/story/news/local/michigan/detroit/2017/08/15/gordie-howe-bridge-first-latin-american-baptist-church-delray/564696001. All images related to the Yaczik family are my own.